Take a scenic 45-minute drive north (map) of Victoria or a 30-minute drive south from Nanaimo and you’ll find yourself in the warm, cozy confines of the Cowichan Valley. The climate here is so good and the growing season and soil so fine, that numerous wineries have set up shop on the sunny slopes – a perfect complement to a Cowichan BC golf vacation. Located in Duncan, the area’s largest community, the Cowichan Golf and Country Club has been at this location overlooking the waters of Cowichan Bay since 1947 when legendary architect A.V. Macan designed one of the finest nine-hole courses on the Island. It expanded to 18 holes in 1985 and meanders through the valley, offering a picturesque mix of meadow and tree-lined holes. Cowichan is a fine place to test your game. The well-established club offers narrow fairways and small, classic greens. You can’t go wrong with a weekend of wine and golf in BC ’s Cowichan Valley. Just a few minutes away, Arbutus Ridge Golf Club straddles Cobble Hill, above the Satellite Channel and the southern Gulf Islands, and looks out to the snow-capped peak of Mount Baker. Designed by Bill Robinson, the course opened in 1987 and has since become known as one of the most scenic in Canada — and a top pick among golfers. The clubhouse, with its gorgeous views, is raved about, as is the service from the staff. But the top reason Arbutus Ridge is such a favourite is the design of the course — it has a very good variety of golf holes. Something else that makes this course very attractive to visitors is what surrounds it: nine award-winning wineries all within a few minutes of each other. 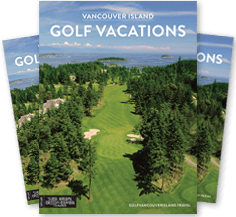 Explore our Cowichan BC Golf Packages, call our toll free number and talk with a Golf Vancouver Island representative, or have fun creating your very own BC golf vacation quote in our “Free Instant Quotes.” Looking for insider tips? Read Sip, Savour & See to find the best places to visit in Cowichan BC while you’re here.